Following up his recent MAX mini-series Haunt of Horror: Edgar Allen Poe, longtime Heavy Metal artist Richard Corben turns his attentions to another famed horror writer in this three-issue mini-series. With Haunt of Horror: H.P. Lovecraft, Corben puts his own unique spin on three of the author's wildest tales, then reprints the original source material immediately after. 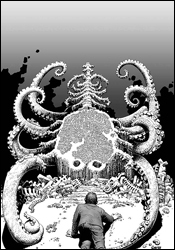 Lovecraft's influence has been notable in comics for ages now, so it should be interesting to see how well his stories make the translation from the written world to the illustrated. For this premiere issue, Corben has chosen two poems and a short story; "Dagon," "Recognition" and "A Memory." While he's changed around a few details in each story, it's never done maliciously or offensively – rather, it merely feels like an alternate telling of the same story. Some of the details are different, but the overall picture is very much the same. I love the decision to include the original text in its entirety, immediately following each of Corben's renditions. While I chose to read them first, no matter which order they're read in, they provide great insight and further depth to each of these stories. Where Corben's tales must frequently sacrifice specific details for the sake of brevity, those clipped words make the written verse more than just a repetition of s story that's already been told. Much in the same way that a feature-length movie can never reach a viewer in quite the same way as a novel, there's no way a seven-page comic strip can go into the same amount of detail as a five-page short story. Here, it's a mutually beneficial relationship: the paneled rendition enhances the story with its mood, style and personality, while the written stories add substance and further detail to the illustrated work. Richard Corben has been active in comics for decades, and his mastery of the form stands evident throughout this issue. While his illustrations may not be picturesque, they aren't intended to be so – his rendering style is exaggerated, overflowing with texture and identity, drawing the reader into the story. Much of what's so striking about this work is that it doesn't fit into any of the standard mainstream archetypes. It has a feel to it that's dated, but still relevant... like it's straight out of the underground comix movement of the late ‘60s and early ‘70s, but it takes itself more seriously than that. Truly, these are some stunning layouts – rich, toned, easy to read but still startlingly original. Corben knows how to lead the reader's eye across the page, noticing every detail along the way, and how to bathe the book in a sharp contrast between black and white. In full color, this work wouldn't have been nearly as effective nor half as beautiful. This is a rare beauty, a literal translation of an existing work that isn't afraid to make the story its own. After more than thirty years in the field, Richard Corben's work is magnificent, worthy of far greater attention than it's granted. While his writing may take these disturbing tales to new places, the mood and the outcome is still the same, and his artwork gives them an incredible identity that the original tales never could have delivered. Buy this, even if you aren't a fan of horror in comics. It's a lesson in great storytelling.